Since January we have been working closely with Cardiff Business School and Cardiff University's Web Services Team to design and implement a content managed website for the school. 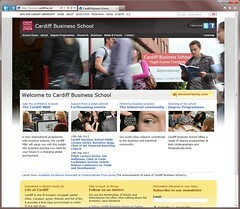 Cardiff Business School is ranked second in the United Kingdom for its leading research. With over 150 faculty members, the school educates over 2500 students each year from over 120 countries, so it was imperative that the website was produced to be as flexible as possible, but with simple navigation and a clear design. Before we began working with the Business School, their exiting website was managed by a select few, through a large number of Dreamweaver templates. Which is great for smaller websites, but with a website of this size it could only be described as madness, giving us a headache just thinking of the complications. With well over 5,000 pages of content we proposed to simplify the management of content using our old favourite: Drupal (an open source content management). After a comprehensive planning stage we were then able to produce a robust multilingual website that can be updated by multiple members of staff, allowing for the website to updated instantly and securely. The site has slowly launched over the last week and its already receiving great feedback from the school faculty.